This roof's asphalt shingles give it a beautiful appearance and valuable protection. As one of the most popular types of roofing, shingle roofing offers a wide variety of benefits that other materials can't match. It's known for its cost-effectiveness, style, and numerous color options. However, some shingle roofing products are better than the rest! Coverall Roofing uses Owens Corning TruDefinition Duration series shingles because they are the only shingles on the market with the SureNail Technology. The SureNail strip is a technological breakthrough in roofing. It is a reinforced woven fabric that is embedded on the nail line of the shingle. To get started on your roof replacement or installation project using these Owens Corning shingles, schedule a free shingle roofing cost estimate with Coverall Roofing today! We are happy to help customers in Macomb, Sterling Heights, Clinton Township, West Bloomfield, Utica, Waterford, Saint Clair Shores, and nearby. The most important part of nailing a shingle to a roof is the area where the nail penetrates the shingle. If a shingle is nailed below the nail line, the nail head may be exposed, allowing water to penetrate through the roof. If a shingle is nailed above the nail line, it may not penetrate through the second shingle underneath it and wind is more likely to blow them off the roof. One of the nice things about having SureNail strips on the shingles is that it gives the installer a clear area to nail. This SureNail strip helps prevent the nail from blowing through the shingle in cases where a compressor's air pressure is up too high. It catches the nail and helps it fasten and stay. The most impressive feature is the strip's sealing ability. The shingles have a Tru-Bond sealant located on the bottom back of the shingle. When this sealant adheres to the SureNail strip on the shingle under it, it is extremely difficult to separate them, allowing the shingles to withstand 130mph winds. This is a very impressive feature to have because shingle blow offs can cause a lot of damage to a home if it's raining. Having TruDefinition Duration series shingles with SureNail technology can make all the difference in situations when bad storms hit. 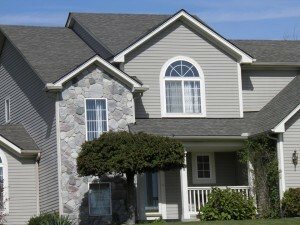 Protect your home with the best with Owens Corning. Having these shingles installed by a preferred roofing contractor of Owens Corning will give you the opportunity to protect your investment with extended warranty options. Coverall Roofing, your local roofing company in Farmington, Rochester, Troy, New Haven, Grosse Pointe, Sterling Heights, Macomb, West Bloomfield, Clinton Township, Waterford, Saint Clair Shores, Utica, and nearby offers free cost estimates for roof replacement - schedule yours today!